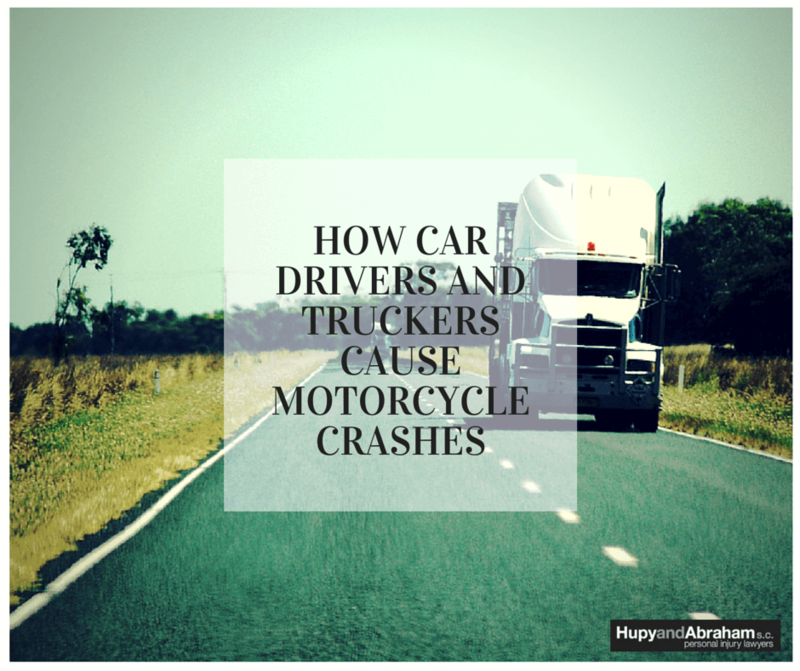 How Car Drivers and Truckers Cause Motorcycle Crashes | Hupy and Abraham, S.C. Car drivers and truckers commonly cause motorcycle crashes. According to the Hurt Report, the driver of the other vehicle violates the motorcyclist’s right-of-way and causes the accident in two-thirds of multiple vehicle accidents involving motorcycles. Drivers of motor vehicles have a duty to look out for motorcyclists and share the roads with them safely. When they fail to do so they are negligent and they should be held accountable for their actions and for the injuries they cause. Fails to see the motorcycle. Sees a rider too late to avoid a crash. Misjudges the bike’s speed and distance. A driver who pulls out of parking space, changes lanes, or even opens a car door without seeing a motorcyclist in time to avoid a crash can cause a catastrophic crash that results in serious injuries or death for the rider. When another driver claims that he didn’t see you, he may be telling the truth. Yet the driver may still be liable—or legally responsible—for your injuries even if he didn’t see you prior to the collision. Drivers have a duty of care to everyone who legally shares the road with them, and this includes motorcyclists. It can be frustrating to hear the words “I didn’t see you” from the other driver. However, you have nothing to gain by reacting to those words at the accident scene or after the crash. You do not need to educate this particular driver about why he should have seen you on your own. Instead, you should share the statement with your attorney and let your lawyer present your interests in a personal injury lawsuit. A personal injury case may help you get the recovery you deserve. This could include compensation for your past, current and future medical expenses, lost income, out-of-pocket costs and other damages. And it may also teach this driver an important tip about motorcycle safety—and encourage him to watch out for motorcyclists in the future.